Yes we are we left Texas on April 25th heading to William Kent Camp Ground just South of Tahoe City Califorina on Lake Tahoe Where we will be God willing untill The last of Sept 2013. We will be at The William Kent Camp Ground. Our trip cross country has been both fun and eventful the first day as we were stopping for the day while pulling into the abilene RV park we blew out one of the tires on the 5th wheel. 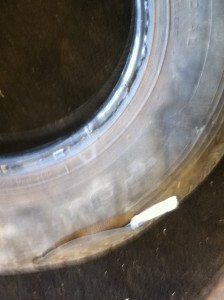 Thanks to Good Samsroad service who came out and put the spare on while we were eating supper. 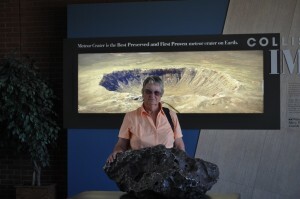 From Santa Rosa State Park we moved on to the Meteor Crater RV park at Winslow AZ. Where we enjoyed two nights and the views of the crater where a Meteor struck this lovely place some 50,000 years ago. Departed here on 4-29-2013. still have not located a tire for the 5th wheel. 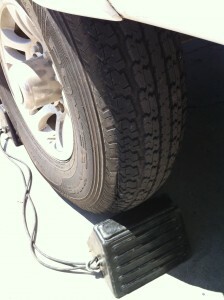 Called a tire dealer in Kingman AZ and they said that they have a tire the size we need. Arrived at hte tire center in Kingman Az. And while backing into the Maintenance bay for the young fellow to change the flat and put the spare back on the rack the guy that was spotting me into position noticed that both tires on the left side of the 5th wheel had seperated and had the tread split some 4 to 6 inches. 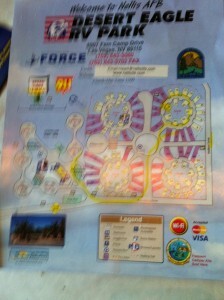 RV Park at Nellis AFB< Las Vegas NV where we spent 2 wonderful nights. 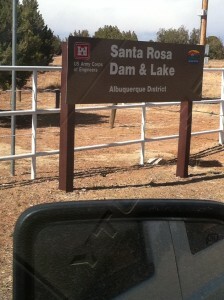 Okay we will sign off for this postg and try to post sooner next time like when we get to the camp ground in California.